Photo: Home at Parkway and Orchard Drives, Mt. Lebanon Historic District, Mt. Lebanon, PA. 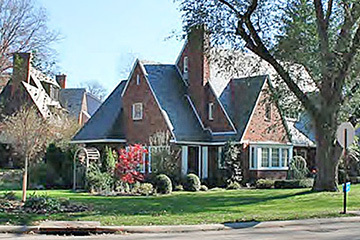 The Historic District was listed on the National Register of Historic Places in 2014. Photograph by Laura C. Ricketts, 2012, for nomination document, Mt. Lebanon Historic District, Allegheny County, PA, National Park Service, National Register of Historic Places. Mount Lebanon (formerly a township) became Home Rule Municipality in 1975, the official name becoming "Mt. Lebanon," or, the Municipality of Mt. Lebanon. Mt. Lebanon's beginnings, like most of southwestern Pennsylvania, were tied to many of the historical events that helped to shape the region. Community historians have identified that Mt. Lebanon was once part of the vast hunting grounds used by the Delaware and Shawnee Indians. The Northern Europeans who settled on these grounds in the late 18th century were primarily farmers who made whiskey from their crops of corn and rye. Many of these farmers joined others across western Pennsylvania and Ohio to boycott the whiskey excise tax and Mt. Lebanon is still recognized for its part in the Whiskey Rebellion of 1794. In the 1880s, a United Presbyterian Church Minister, Reverend Joseph Clokey, brought two Cedar of Lebanon trees from the Holy Land to his home on Bower Hill. When the local Post Office was founded nearby, it took its cue from those two trees on the hill and named the Post Office "Mount Lebanon" later becoming the name for the community. In the early 1900s, the first street car arrived from Pittsburgh on a single track that ended at Cedar Boulevard. This occurred during the electric streetcar and railroad era of suburban growth in the United States. The rail line and the stations that evolved during this time period would be the catalyst for many of the suburbs that formed along the corridors leading into the cities. This direct route into the city would catapult Mt. Lebanon into a highly desirable suburb. Mt. Lebanon residents' desire for improvements like street crossings, boardwalks, streetlights, fire and police protection, and improved schools reflected the increasingly suburban character of the township as opposed to its decidedly rural neighbors. For a portion of its history, Mt. Lebanon was a part of the much larger St. Clair Township, then Upper St. Clair and finally Scott Township until 1912, when the citizens of the Mt. Lebanon area of Scott Township voted to incorporate what is now Mt. Lebanon under the legislative act providing for the establishment of a "First Class Township" government. In 1912, the new Mt. Lebanon Township was home to 1,705 residents and only six automobiles. Many of Mt. Lebanon's residents joined in a campaign supporting the construction of a traffic tunnel leading from Pittsburgh through Mt. Washington to the South Hills to improve access and support development. A total of at least six separate tunnel projects were proposed and contemplated before the county finally decided in 1919 on the current site of the Liberty Tubes. The competing interests of different South Hills communities, land speculators, and businessmen resulted in a "geographical partisanship" that manifested in the creation of organized lobbying groups including the South Hills Board of Trade (1908) and its splinter group the South Hills Tunnel Association, which sponsored the alternative that would best suit Mt. Lebanon's interests. In the meantime, speculators, developers, and local landowners in Mt. Lebanon began a frenzy of subdividing former farm properties into residential plans in advance of the tunnel. Images from this time depict the rush to develop Mt. Lebanon as an automobile suburb. When the Liberty Tubes, "the world's first long automobile traffic tunnel," finally opened in 1924 (at a location that did indeed benefit Mt. Lebanon's interests), its impact on the South Hills was dramatic. The opening of the Liberty Tubes in 1924 not only increased transportation access to the city, but sparked a residential building boom in the rolling hills south of the city as well. Between 1920 and 1930, the population of Mt. Lebanon went from 2,258 to 13,403, marking an increase of approx. 500%. Stemming from these historical decisions and actions, tree lined streets, homes with varying character, neighborhoods ranging in intensities, a nationally recognized public education system and a variety of parks and recreation facilities continually attract and retain Mt. Lebanon residents. Mt. Lebanon's livelihood has and will continue to be tied to its system of transportation. Easy access exists between the City of Pittsburgh and many other communities in the surrounding region. These types of corridors are home to each of the numerous business districts of Mt. Lebanon. However, like many other communities, traffic volumes, speeds and pedestrian-oriented routes are ever present considerations along regional-scale and local corridors in the Municipality. Mt. Lebanon is the only first-ring suburb within the Pittsburgh region that offers its residents such an array and extent of options for mobility. Elevating Mt. Lebanon—Looking Beyond Today's Horizon, Mt. Lebanon comprehensive plan, 2013, www.mtlebanon.org, accessed October, 2014.